Hello everyone - perhaps the VC could confirm if she has a fish! Lets hope so, I don't think there are any reports of her eating since 12 June but I may be wrong! I've passed on all your thoughts to Moffer, who should have the IT expert with her at the moment, and she was very appreciative. I have updated her with the news about Rutland and Aviemore. 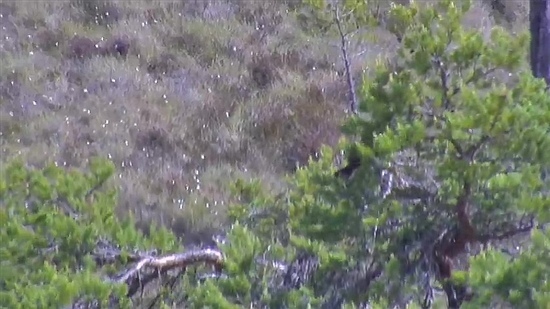 EJ is still in the Love Tree, and appears to have paused her eating at the moment. I am popping out for a bit, but will be in and out. "Birds are, quite simply, little miracles - and as such they require care and consideration." Hello Scylla! EJ is still bobbing around in the Love Tree, and still taking bites at her fish - her head goes down and her tail rises every so often! Good morning to all! Thanks for starting up the new thread, scylla. Thanks also for the report from Aviemore and from LG. Good to see EJ's tail as she tears bits off her fish! Unfortunately I didn't find her popping to the nest with her fish on the way to the Love Tree. Alarm calling from EJ as she flaps in the tree just now. Threat over, it seems. Alarm calling from EJ as she flaps in the tree just now. I didn't even hear it!